As organizations grow and age they soon acquire various myths or legends that attach themselves to the organization and become a part of its heritage and lore. For Wheaton College this is no different. Many Wheatonites, if asked, could readily cite one or two of these myths and the first would most likely have to do with Wheaton College and the Underground Railroad. For those not in the know, for decades it was purported that Wheaton College was a stop on the Underground Railroad. Supported by Wheaton’s history as an abolitionist school, for many years there was no “hard” evidence to support this myth. As reported in this blog, evidence is now known and this myth moved to the fact category. Other myths that are associated with Wheaton College range from the mundane to the bizarre. Myths are perpetuated and maintain a life of their own because they often contain some elements of truth or plausibility. One such mundane myth is that the Billy Graham Center is sinking. The rates and speed often vary, but the myth states that the Graham Center was built on an ancient aquifer that was naturally swampy (true). Since the BGC is so large and weighty it is too much for this hydric soil. The land around the BGC naturally attracts water and the adjacent parking area has been known to flood in heavy rains, stranding and ruining dozens of vehicles over the years. Novice historians will note that when the land was cleared and prepped for construction that air hammers rammed dozens and dozens of telephone poles into the soil to serve as pylons for the massive new structure (true). Myth has it that the pylons are decaying and the building is sinking at the rate of an inch or so a year. This all sounds well and good. It seems plausible. Yet, when one brings mathematics into the equation it quickly calls into question the veracity of the myth. If the BGC was opened in 1980 and it is sinking an inch a year then it would have moved 32 inches deeper into the ground. That’s nearly 3 feet! Even if the rate of sinkage was one-eighth inch it would translate to a building that is four inches lower than when it was built. This is half of a step, something we all would notice. Another myth that continues to capture the attention of students for many decades is the existence of a secret satanic library in “attic” of the Billy Graham Center. When the fifth floor of the Billy Graham Center was used for storage and off-limits students would sneak onto the floor in search of the legendary occult library. Does or did such a library exist? Yes and no. 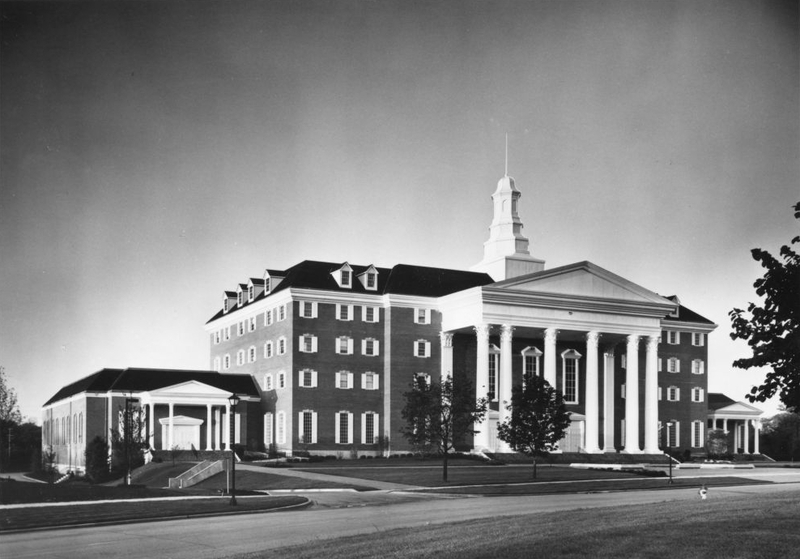 From 1974 to 2004 the Billy Graham Center operated a library as an extension of its mission. This library, like the museum and Graham Archives, collected materials related to missions and evangelism. In the course of its work it received a large donation of books on cults and the occult from a scholar. The Graham library placed the donation in boxes in a storage cage on the top floor of the Graham Center until they determined what to do with this gift. After several years other priorities took hold and the donation remained untouched. To exacerbate the delays further in 1997 the staff of the Graham library was reduced significantly due to funding shortfalls. In 2004 further budgetary issues caused the remaining Graham library staff to be let go. At that time the staff of Buswell Memorial Library became responsible for the collections of the Billy Graham Center Library and Buswell’s collection development librarian soon began going through the backlog of the Graham library including the languishing “secret” donation. The quality of the collection was inconsistent and some of volumes were not suitable for addition to the college’s collection. Others were deemed outside of the curricular needs or research interests. Useful books were cataloged and added to Buswell Library’s collections and shelves. And, others were deemed unsuitable for retention. It was some of these latter titles that were the most provocative and intriguing to the eyes of students as they sneaked around and peered into the storage cage. Some of these title were related to the occult and occult practices. So, was there an “occult library?” Yes, sort of. Was it secret? No. Did it allow for really spooky fun? Just ask the dozens of students who made their way to the storage cage or who keep the story alive. Other myths include slave tunnels around Blanchard Hall and, even, horses being buried behind Blanchard. There are myths related to notable individuals, such as Wes Craven lived on Elm St. while living in Wheaton, thus helping to inspire the title of his noted horror film. With myths the only limit is the limits on one’s imagination.